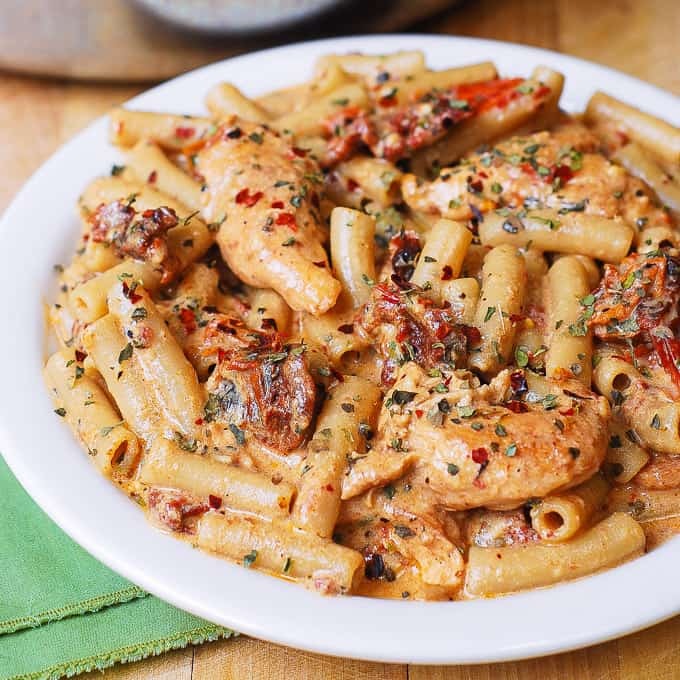 Chicken Mozzarella Pasta with Sun-Dried Tomatoes – Italian-inspired dinner with the best homemade creamy pasta sauce! The sun-dried tomato pasta sauce is made from scratch using basil, red pepper flakes, garlic, paprika, cream, and shredded Mozzarella cheese. 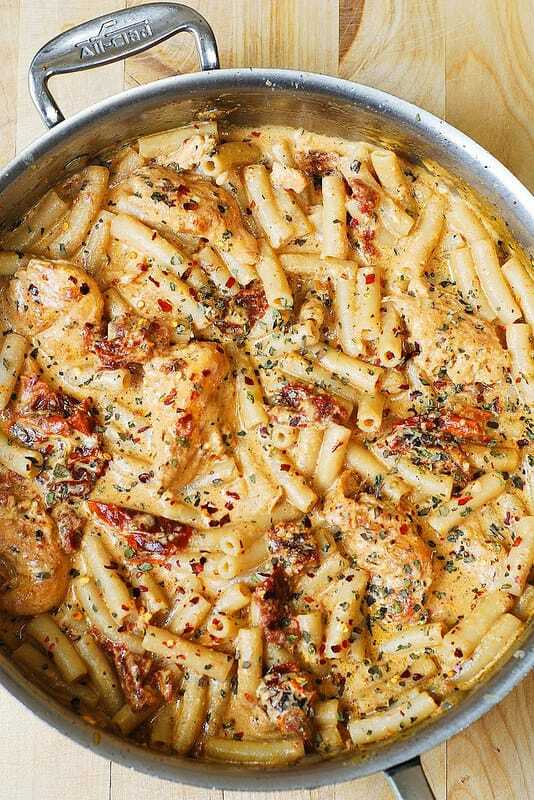 I am a huge fan of pasta, and some of the most popular pasta recipes on this site include this chicken mozzarella pasta that you are reading right now, creamy chicken pasta with bacon, and pesto chicken pasta. One thing all these pasta recipes have in common is that they use creamy, comforting sauces. If you want to try chicken pasta that is more refreshing, without the creamy sauce, I whole-heartedly recommend family favorite chicken pasta with spinach and tomatoes or super flavorful Italian sausage pasta. This recipe features sun-dried tomatoes and basil. Both ingredients are popular in Italy and in the Mediterranean region. The most prominent flavor in this recipe is the homemade sun-dried tomato sauce. The sauce is made from scratch by combining cream with shredded Mozzarella cheese, sun-dried tomatoes, garlic, basil, and red pepper flakes. Cooked chicken and penne pasta are then smothered in this delicious creamy Mozzarella pasta sauce. There is enough sauce to coat every single bite. In a large skillet, cook 3 cloves of minced garlic and 4 oz of chopped sun-dried tomatoes in 1 tablespoon of olive oil on high-medium heat for about 1 minute. Add 1/2 cup of heavy cream + 1/2 cup of milk (or 1 cup of half-and-half) to the same skillet and bring to a boil. Reduce to simmer. Add 1 cup of shredded Mozzarella cheese. Simmer and stir until the cheese melts and forms a creamy pasta sauce. Add 1 tablespoon of dried basil, paprika, and at least 1/4 teaspoon of red pepper flakes. Stir to combine. Season with about 1/4 teaspoon of salt. Use either sun-dried tomatoes without oil or sun-dried tomatoes in oil (in a jar). Note: if using sun-dried tomatoes in oil (in a jar), make sure to drain sun-dried tomatoes from oil, before using them. Sprinkle a small amount of paprika over the chicken before cooking – it adds flavor as well as the color to the dish. Make sure to reserve some pasta water as you will DEFINITELY need it to thin out the cream sauce. Feel free to increase the amount of spices for this recipe: basil, red pepper flakes, paprika. This will make the sun-dried tomato sauce even more flavorful! Make sure to season the chicken mozzarella pasta with just the right amount of salt. That means you might have to add more salt. Salt will enhance the flavors of basil and sun-dried tomatoes. 1) In a large skillet, on medium heat sauté garlic and sun-dried tomatoes in the olive oil. Remove the sun-dried tomatoes from the skillet. 2) Season sliced chicken with salt and paprika. 3) Add the chicken to the skillet and cook on high heat. 4) Add back the sun-dried tomatoes. Add half-and-half and shredded Mozzarella cheese. 5) Bring the mixture to boil, then reduce to simmer and stir the sun-dried tomato sauce until the cheese melts. 6) Add spices: basil, crushed red pepper flakes, salt. 7) Add cooked and drained penne pasta and stir to combine. Creamy Shrimp Pasta with Mozzarella Sauce features shrimp instead of chicken. Asiago Chicken Pasta with Sun-Dried Tomatoes and Spinach – this sun-dried tomato pasta is made even more flavorful with the addition of Asiago cheese and spinach. Scallop Pasta features scallops – another protein you can use in place of chicken in a recipe that is otherwise very similar to this one. Creamy Mozzarella Pasta with Smoked Sausage is a great choice if you want to make the same pasta with sausage. Sun-Dried Tomato and Mushroom Pasta is the meatless version of this recipe. 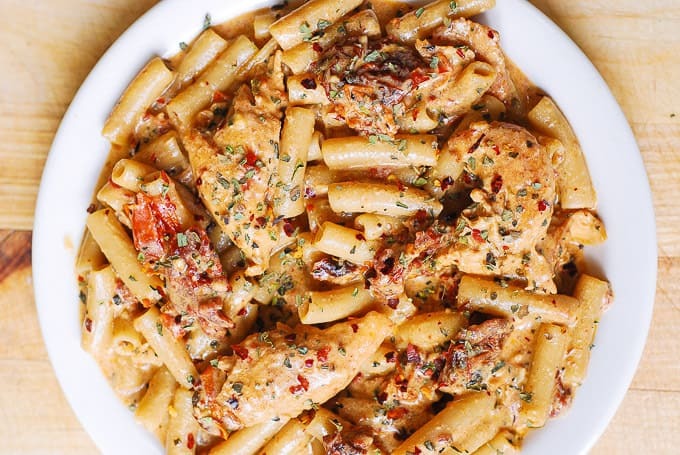 This easy Italian-inspired Chicken Mozzarella Pasta features sun-dried tomatoes, garlic, basil, red pepper flakes, and paprika. The sun-dried tomato sauce is the star of this recipe! In a large skillet, sauté garlic and sun-dried tomatoes (drained from oil) in 2 tablespoons of olive oil (reserved from the sun-dried tomatoes jar) for 1 minute on medium heat until the garlic is fragrant. Remove the sun-dried tomatoes from the skillet, leaving the olive oil. Add sliced chicken (salted and lightly covered in paprika for color) and cook on high heat for 1 minute on each side. Remove from heat. Cook pasta according to package instructions. Reserve some cooked pasta water. Drain the pasta. 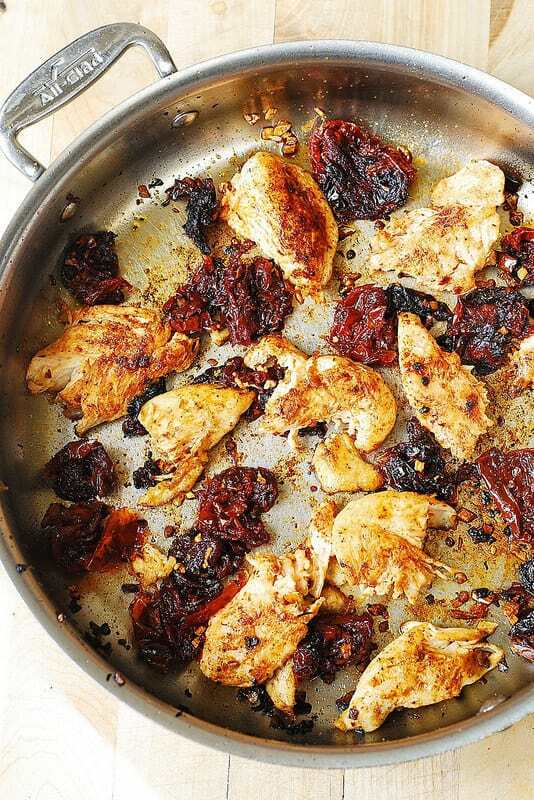 Slice sun-dried tomatoes into smaller pieces and add them back to the skillet with chicken. To make creamy pasta sauce, add half-and-half (see substitution for half-and-half in the Recipe Notes section below) and Mozzarella cheese to the skillet, and bring to a gentle boil. Immediately reduce to simmer and cook, constantly stirring, until all cheese melts and creamy sauce forms. Add cooked and drained pasta to the skillet with the cream sauce, and stir to combine. Add 1 tablespoon of basil, and at least 1/4 teaspoon of red pepper flakes. Stir to combine. If the creamy sauce is too thick: Add about 1/2 cup of reserved cooked pasta water to the skillet to thin it out. Do not add all of pasta water at once - you might need less or more of it. 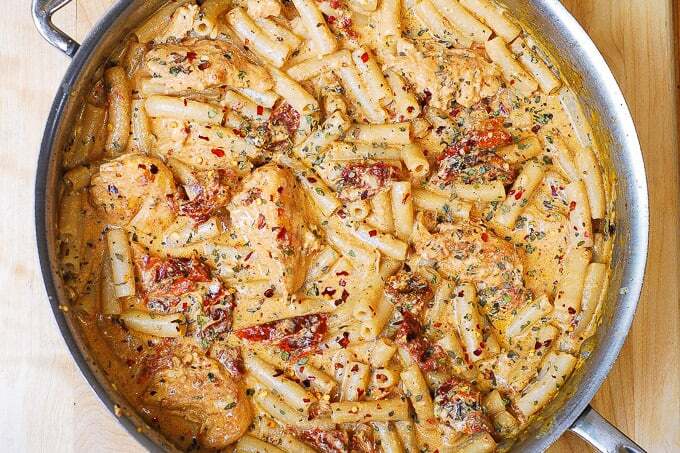 Season the chicken pasta with salt and more red pepper flakes, to taste, if needed. Let it simmer for a couple of minutes for flavors to combine. Note: Make sure to salt the dish just enough to bring out of the flavors of basil and sun-dried tomatoes. What is half-and-half? Substitute 1/2 cup of milk + 1/2 cup of heavy cream for 1 cup of half-and-half. If using sun-dried tomatoes in olive oil (in a jar), make sure to drain sun-dried tomatoes from oil, before using them. Reserve 2 tablespoons of this drained olive oil. Do not use fresh Mozzarella. Fresh Mozzarella is usually sold as a large ball or small balls in a brine or water solution. Do not shred fresh Mozzarella. Use pre-shredded Mozzarella cheese sold in bags. This was fantastic. I had searched for a pasta with chicken, sundried tomatoes and cream similar to one I’d had at restaurants in the Bay Area. I added one strip of bacon, crumbled and sauteed the chicken and garlic/tomatoes in the same pan I cooked the bacon in for a smokey flavor. My family LOVED it!! Thank you, Christy! So glad you enjoyed this pasta dish. The addition of bacon sounds delicious! Made exactly like recipe and added parmesan cheese! Fantastic! 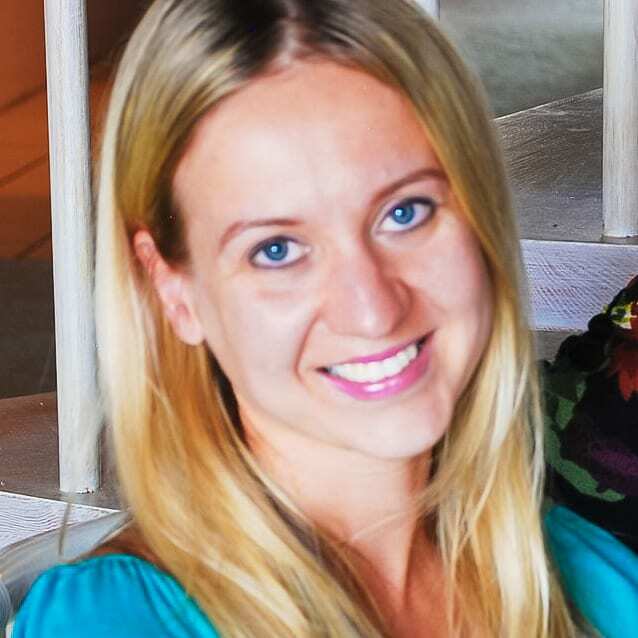 Anna, I am so glad you liked this pasta! I love this recipe, I’ve made it a few time now. I think my luck came from using Hungarian paprika, it just happened to he what I had and the flavors are amazing! This time I added shrimp and spinach to fancy it up for cozy date night dinner. I love it even more now!! TFS!! I am so glad you have been enjoying this recipe! Yes, Hungarian paprika would taste great with this pasta! Thank you so much for sharing this recipe, I will try it! I followed the directions and recipe exactly how you wrote it and it curdled while cooking. Our dinner was ruined. I DO NOT recommend bringing sauce to a boil as the recipe calls for. Will make again with my own temp adjustments and ingredients. I had the curdling issue as well! I think the oily base was too hot to add the half and half right then. Will probably try again, with some adjustments. Does this dish reheat well the next day? I would like to make it one & serve it the next. I added rosemary to this, loved it. Thank you ; good to know all kinds of pasta could be used ! I definitely want to make this recipe. 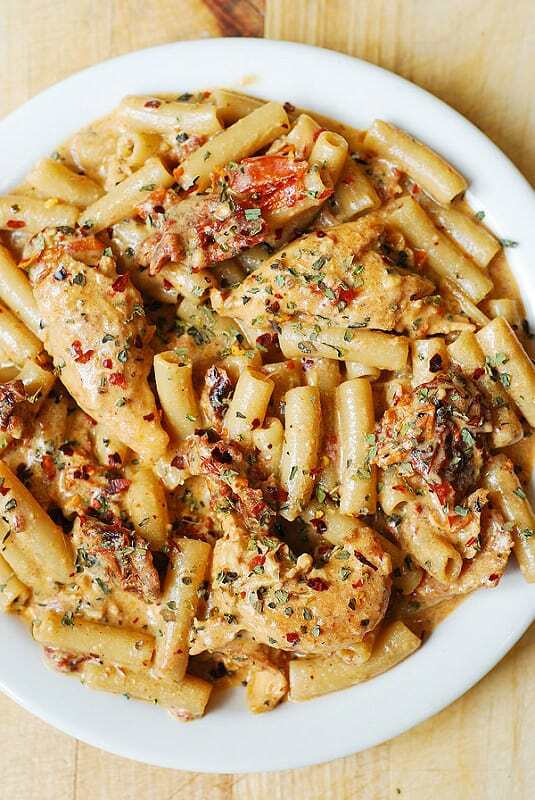 Your recipe calls for 8 ounces of Penne pasta. Your recipe does not go much into the pasta. Is the pasta just measured out dry to 8 ounces? Do you just cook it according to package directions? Yes, I used 8 ounces of dry pasta – I think my package actually had exactly 8 oz. I cook it according to package instructions al dente. I’ve made this recipe with regular pasta and with gluten free brown rice pasta as well.